If you're a fan of relaxed dressing when it comes to your personal style, you'll love this chic pairing of a yellow velvet midi dress and brown leather gloves. Bump up the cool of your getup by finishing off with black leather knee high boots. If you're all about comfort dressing when it comes to your personal style, you'll love this totally stylish combo of a beige coat and Portolano pine brown nappa leather itouch tech gloves from Bluefly. Spruce up your outfit with gold leather pumps. 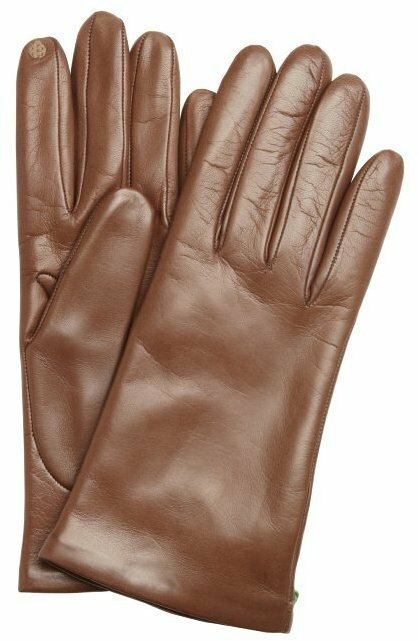 If you're obsessed with functionality dressing when it comes to your personal style, you'll love this totally stylish combo of a beige coat and Portolano pine brown nappa leather itouch tech gloves from Bluefly. Perk up your getup with tobacco leather knee high boots. If you're all about practicality dressing when it comes to your personal style, you'll love this cute pairing of a white cape coat and Portolano pine brown nappa leather itouch tech gloves. Bump up the cool of your ensemble by finishing off with black leather pumps. Team a grey fur vest with Portolano pine brown nappa leather itouch tech gloves if you're hunting for an outfit idea for when you want to look casually cool. Rocking a pair of black leather over the knee boots is a simple way to add extra flair to your look.